Sara Nosworthy, left, Jennifer Evangelista and Jennifer Jordan are the RNs and driving force behind a fresh, 24-7 approach to accessible education and keeping skills sharp for the busy emergency department nurses at Foothills Medical Centre. CALGARY — Bringing relevant, interesting and convenient education to busy emergency department (ED) nurses is no picnic in the park. 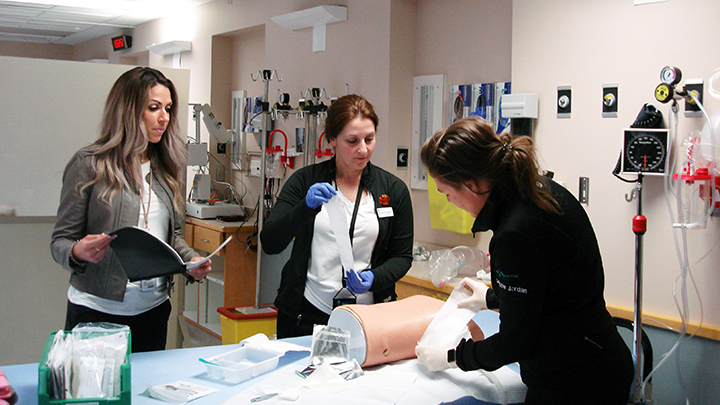 Yet it’s a challenge clinical educators at Foothills Medical Centre not only embraced, but overcame by creating hands-on education stations that nurses can access around the clock in their fast-paced environment. “We had to figure out a way to do it for our 280 nurses who are working 24 hours a day, seven days a week — and we’re not always there — so we needed to ensure these education stations are easy to follow and that people could do them on their own without getting frustrated,” says Sara Nosworthy, a registered nurse and now adult trauma coordinator at Foothills. She and her fellow RNs — Jennifer Jordan, now a quality improvement nurse, and Jennifer Evangelista, a clinical nurse educator — put their heads together in 2017 to drastically rethink the traditional classroom model and step into uncharted waters. Their journey paid off. What they came up with were self-directed education stations — each offering an opportunity or simulation to keep skills sharp and polished — that can be completed in 15 minutes or less, right in the emergency department during downtime. The education stations are set up in the ED for easy access by all staff and are rotated every six to eight weeks. Each station highlights different systems and skills in which ED nurses are required to be competent. Completion of an education station is confirmed through a five-question online exam. “We worked collaboratively with our simulation team with the equipment that we had in the emergency department as well as with the University of Calgary to find more equipment, which was loaned to us,” says Nosworthy. Their efforts have also garnered praise from leadership. To date, eight stations have been created, covering skills and topics in areas such as access (implanted ports), cardiac (recognizing and treating dysrhythmias), trauma (thoracotomy use), respiratory (ventilator management, inline suctioning), pediatrics (medication calculation and administration) and neuro (identifying and managing stroke patients) — to name a few. A big upside to this 24-7 module approach is it has freed up more time during the nurses’ traditional annual education day for other subjects and simulations, where a group approach is more effective. This comprehensive program and new style of education is now spreading across the province.